When you think of an industrial facility such as the Tesla Lithium Battery Gigafactory, it is easy to overlook the need for water to run it. But most places that make things need to use water at some point in the process. The Tracy power plant east of Reno is an example. It is located on the Truckee River because to make power you need water for both the steam-powered turbines and for cooling. How much water will the Tesla Lithium Battery Gigafactory require every year? Will Tesla’s gigafactory recycle water and have little net use of water? Or will it require lots of water? 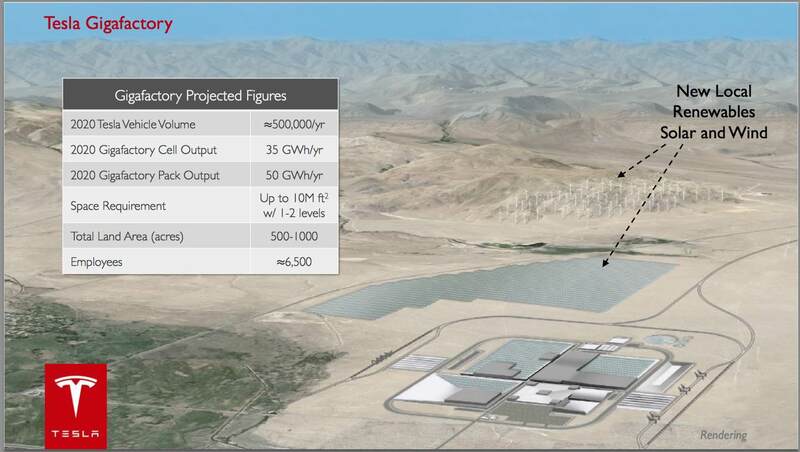 The proposed Tesla Battery Gigafactory designed to match the 2013 world-wide output of lithium batteries by 2020. The gigafactory is now slated for Nevada’s Storey County in the TRI Center. On September 5th, Mark Robison of the RGJ wrote an article “No water worries for Tesla at Reno industrial park.” Therein he quotes the owner of the Tahoe-Reno Industrial Park (TRI), Lance Gilman, as claiming he has ample water. In a more recent RGJ article on Reno’s potential lack of sewer capacity, it said TRI would like to receive water from the Truckee Meadows Water Reclamation Facility. The TRI facility lies within the Truckee River watershed and groundwater or surface water use will impact the Truckee River and Pyramid Lake and communities east of the Truckee Meadows. 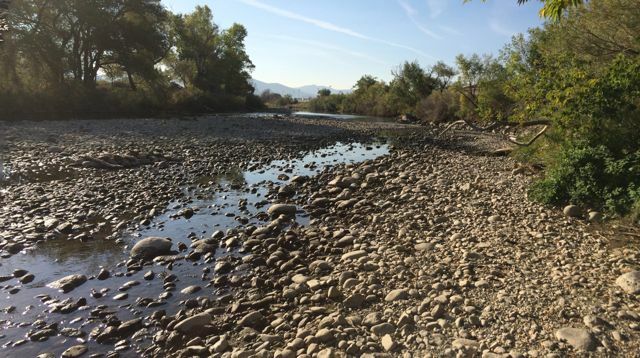 The Truckee River in September 2014 below the Glendale TMWA Treatment Plant is mostly dry. How much water Tesla needs and where that water will come from did not appear to be part of the decision-making process for Governor Sandoval’s negotiators. It should have been. The Tesla deal could cost us a lot more than the negotiated $1.25 billion. This entry was posted in Conserve, Fish and Wildlife, Keep it flowing and tagged communities, future on September 30, 2014 by Dennis Ghiglieri. 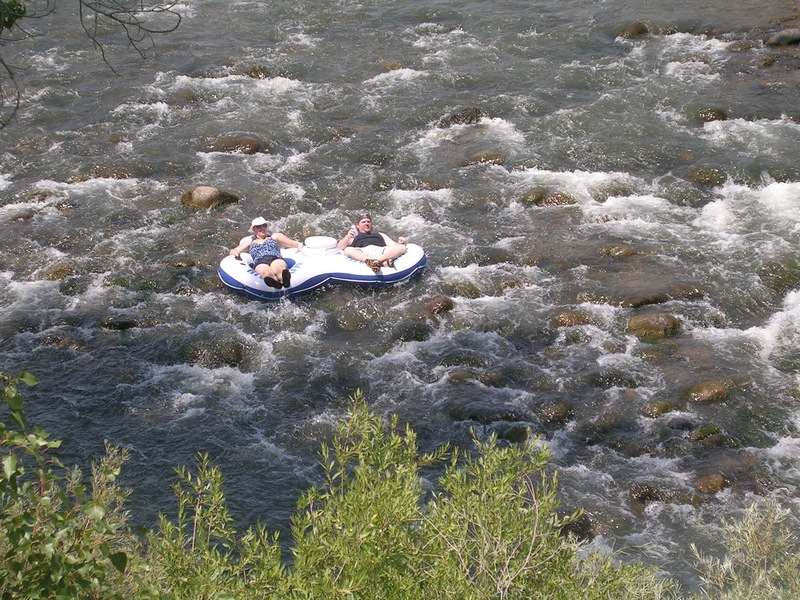 The Truckee River is the keystone of our communities from the town of Truckee in California across the state line in Nevada to the cities of Reno and Sparks, and continuing on to Wadsworth and Nixon on the Pyramid Lake Paiute Reservation. The river is our life blood supplying water for many uses along its 114 mile length. The river paints a different scene with its sinuous blue ribbon of water through each day and throughout the year. It talks to its visitors in its turbulent rapids and quiet riffles alike. It is home to fishes and birds in all seasons. It is a place of solace for all of us. The goal on our pages is to remind us that the Truckee River is essential to our way-of-life – to remind us that we use the river but must not over-use the river – to remind us that a clean river is not just essential to fish and wildlife but to all of us as well – to remind us that flood plains are publicly costly places to develop businesses and infrastructure – to remind us that recreation is dependent on public access to the river – to remind us that flood-control is best achieved by not needing it – to remind us that restoring the river is akin to restoring our future. We welcome discussion on our pages of the often complex water issues facing our communities. Understanding the important roles of water conservation, water treatment, flood control, river restoration, river recreation, and protecting the river floodplain is necessary to the formation of sound public policies to keep the river healthy for generations to come. We hope that the website will also offer background and resource and historical information which will inform us all. Your help in commenting and offering feedback will help us in making sure our information is up-to-date and accurate. This entry was posted in Flood Project, Keep it flowing, Keep River Access, River Restoration and tagged communities, future, welcome on December 11, 2013 by Dennis Ghiglieri.